Brand: Wilton 2105-7783 Units: 1 Dimensions: 11" wide x 16" long x 2¼" deep Easily make multi color or multi flavor cupcakes with this 12 cavity standard cupcake pan and batter insert. Place insert into cavities and fill center 2/3 full with batter. Next, fill outside ring 2/3 full with a different color or flavor. Remove insert and allow excess batter to drip back into cavities. Continue with the next row until all cavities are full. Note: Do not put insert in oven. 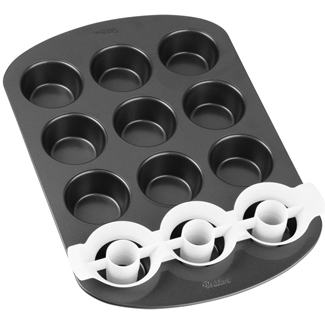 Easily make multi color or multi flavor cupcakes with this 12 cavity standard cupcake pan and batter insert. Place insert into cavities and fill center 2/3 full with batter. Next, fill outside ring 2/3 full with a different color or flavor. Remove insert and allow excess batter to drip back into cavities. Continue with the next row until all cavities are full.